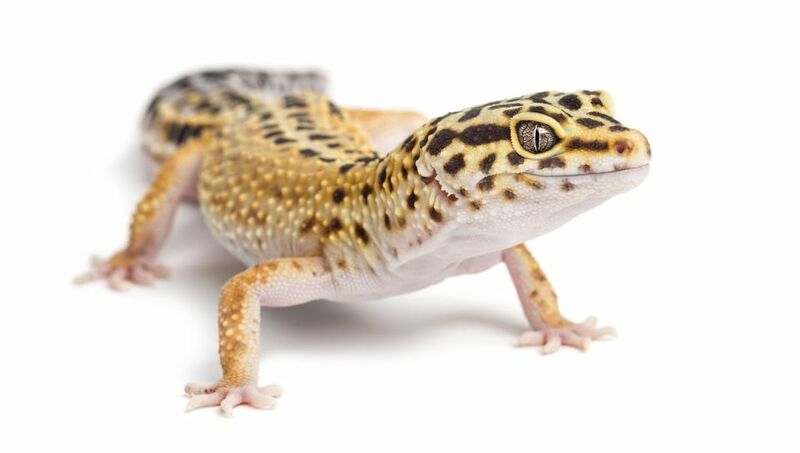 A popular beginner's reptile, the leopard gecko comes in a variety of colors and is an easily handled, small lizard. Leopard geckos are commonly yellow, white, and spotted with black dots. Hatchlings start out more striped and gradually change to the spotted appearance. There are several color and pattern variations called morphs, which include almost every color of the rainbow. Certain colors are more desired and valuable while the common wild-type or normal coloration is readily available and very affordable. Name: Leopard gecko, Eublepharis macularius. Lifespan: Leopard geckos may live 20 or more years in captivity. Size: Leopard geckos reach approximately 8 to 10 inches in length, including their tails. Leopard geckos are nocturnal, ground-dwelling geckos that are generally docile and easy to tame. They do not have the sticky toe pads like other geckos, so they do not climb walls, but unlike other geckos, they do have eyelids. Leopard geckos are not prone to biting and are usually slow-moving. They have perky personalities and are known to be very vocal, especially when they are hungry. If you have more than one leopard gecko in an enclosure, keep an eye out for tail-waving. This means a leopard gecko feels threatened and is about to attack. You'll want to separate them right away. Leopard geckos also are tail rattlers, similar to rattlesnakes. Tail rattling means your leopard gecko is excited, with either eating or mating on its mind. And just like a lot of other lizards, when they feel endangered, leopard geckos can self-amputate their tails as a defense mechanism. It would be unusual to see this in captivity, but it's among the quirky behaviors you may see in a leopard gecko. A 15- to 20-gallon tank is large enough for two to three leopard geckos, but there should only be one male per tank, and only keep males and females together if you are prepared to deal with offspring. Half logs provide hiding and climbing space, as do commercial reptile caves and simple cardboard boxes. A damp hide box can help with shedding. Old fish tanks that don't hold water anymore also work perfectly well for leopard geckos. Being nocturnal, leopard geckos do not require special UVB lighting. A regular white light incandescent heat bulb could be used to provide a basking spot during the day and a red heat bulb, blue/purple heat bulb, or ceramic heat emitter can be used to provide supplemental heat at night. Undertank heating pads can be used, but they may make it difficult to properly regulate your gecko's temperatures. If your gecko burrows down to the glass surface of the tank, do not use a heating pad, as it could cause burns. Never use hot rocks. Aim for a daytime basking spot of 88 F (31 C) with a thermal gradient down to about 75 F (around 24 C). At night the temperature can drop to a gradient of 70 to 75 F (21 to 24 C). Make sure your gecko is not exposed to any drafts, and do not place the tank next to a window or door. Leopard geckos do not need very humid environments, but if the humidity is too low (below 20 percent) you may find that your gecko has trouble shedding. Young leopard geckos shouldn't be kept on sand, even if it is calcium sand, as they may ingest it and suffer an intestinal blockage. Paper is absorbent and easy to change, and indoor/outdoor carpet works well, too. Avoid wood shavings, since they can cut your gecko's tiny feet; moreover, the oils in the wood may be irritating to them. Whatever is used, make sure it is not being ingested along with your gecko's meals. Some people choose to feed their geckos in a separate environment in an empty container to avoid this concern. A shallow dish of water should be provided at all times for your leopard gecko. The water will aid in humidity in the enclosure, and your gecko will drink from the bowl. You may even find a gecko voluntarily soaking in its water. Leopard geckos are insectivores, so you should feed a variety of crickets, waxworms, mealworms (in moderation only), and perhaps an occasional pinkie mouse for large adults. Insects must be gut loaded for at least 24 hours prior to feeding and then coated with a calcium/D3 supplement at every feeding for young lizards, every other feeding for adults. Juveniles should be fed a few crickets daily, but adults can skip several days between feedings. One of the most serious conditions that can afflict leopard geckos is metabolic bone disease. Just like humans, geckos become ill if they don't get enough calcium and vitamin D. Metabolic bone disease can cause painful spine and limb deformities, and the animal will display a poor appetite and tremors. Leopard geckos also are prone to gastroenteritis, which comes from a bacterial infection. If your gecko has watery stools or its tail shrinks, these are signs of gastroenteritis. This condition is potentially fatal but can be treated if caught early. And like other lizards, leopard geckos that are undernourished or live in a cage with insufficient moisture may develop dysecdysis. This condition, which looks like dry skin, causes the gecko to have difficulty shedding and can affect its vision. Finally, leopard geckos are susceptible to a variety of respiratory infections, including pneumonia. Wheezing or bubbles of mucus around its nasal passages and mouth are a sign your leopard gecko is having respiratory problems. All of these conditions should receive treatment from a veterinarian who specializes in reptiles. These highly popular pets are readily available, but it's always best to purchase geckos from a reputable breeder. Since they are such long-lived lizards, be sure you're prepared to care for a leopard gecko for an extended time. When you first bring home your leopard gecko, you can socialize it by gently handling it. They'll tolerate a certain amount of contact, but don't overdo it or your leopard gecko may become stressed. If you’re interested in learning about other geckos as possible pets, check out these breeds similar to the leopard gecko. If you're still deciding, you can check out all of our other gecko breed profiles.